First up, here is a collage of wave studies 21 through 50. I did leave out two studies that give me the shudders to look at. I usually will post the good, bad, and the ugly but they were posted in earlier posts so I chose to leave them out. The paintings are a little distorted. 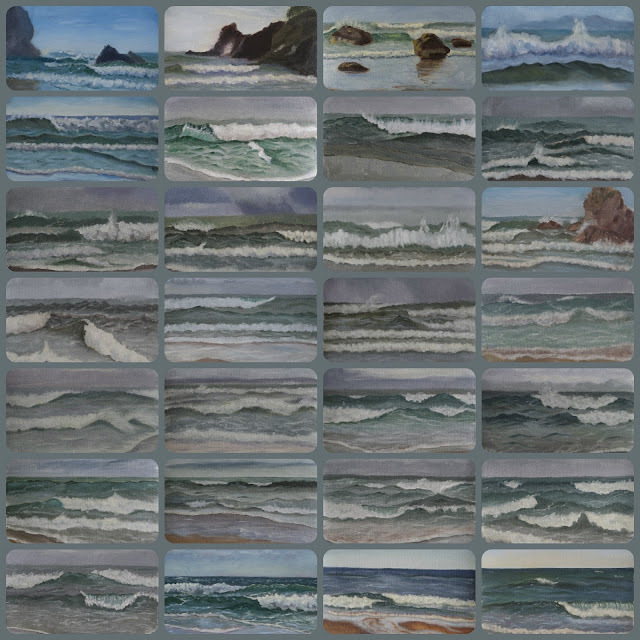 I had challenges with the program and then I couldn't find some of my wave studies in my iphoto files but here it is, more or less. I have had a few challenges getting to the beach too. Last weekend we had sunny weather and it got to over 80 degrees! In May! We ditched our chores and sat and read in the sunshine and overdosed on vitamin D. We went down to the beach to view the sunset Saturday evening. It was beautiful and warm. What I didn't know until it was too late was that the unseasonable warmth hatched a vicious little no-seeum that is about the size of a small freckle. Suddenly I realized I was being brutally bitten! My arms, legs, and feet were bare and are now covered with many many itchy achy welts. I tried to go painting on the beach Monday morning but I had forgotten the panel holder to my new setup. I decided to sketch until I realized I was adding to my collection of itchy bites. I fled the beach and have vowed not to return until the nasty little creatures have died off.The weather has cooled again so I will try again on Monday. In the meantime, I have been working on the large painting in my studio. It still isn't to a point to show the work in progress yet. I have a few more odds and ends to add this post as well. This Labor Day weekend at the end of summer will mark the end of my fourth year of art studies. If I was able to continue learning with the wonderful teachers I started out with, I would be finished at that time. Not much will be changing, my studies will continue and I will continue to grow into my art. I have decided that after Labor Day, I will not always show the bad and the ugly. I might talk about it, but I am going to be a bit more selective on what images I post. It would have been wonderful to have been able to move to Maui with the school, however, I also feel not continuing has forced me to grow in another direction. 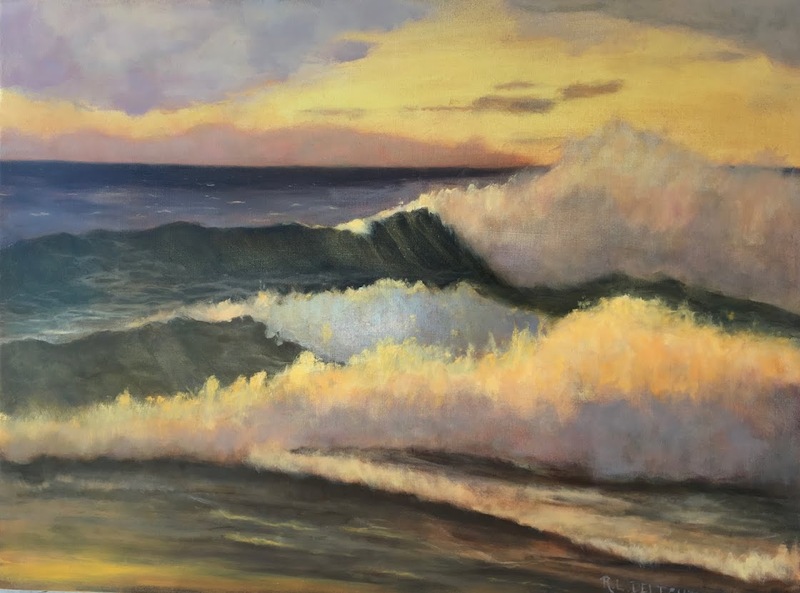 It might have taken me much longer to find my passion for painting the sea. I guess what I am trying to say is that I am at peace with the unexpected twist in my art education. Finally, the next set of wave studies are going to focus on breakers. More specifically on the foam of the wave. I decided to do several studies on the breakers and then on the foam tracings. I will paint them until I feel I am ready to move on. They might not be terribly exciting to look at but I will be posting them. This summer I will also be expanding my view to the many state parks that surround us (lucky us!). I will be painting more studies like the last one at Ecola State Park. I would like to do that once a week or once every two weeks. I will leave you all with this carrot to dangle, If all goes as planned, I will have a wonderful excursion to post about on Monday. It is going to be a very busy weekend! Your collage is awesome!!! I just love seeing your waves together. What an achievement.